...crafting with my stash, the Silhouette Cameo and Groovi®. Card making & scrapbooking lessons helping you to use your stash and utilize your Silhouette machine to the full. Find your Crafty Envelope Punch Board Calculator here too, works with WRMK and Stampin' Up Envelope Punch Boards. 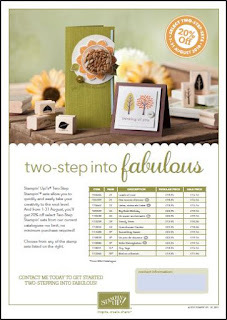 Its almost August and while I have a moment, I will let you all know about the "two-step into fabulous" offer Stampin' Up will be running during August. This is a great opportunity to treat yourselves to those stamp sets that were a little more expensive than you wanted them to be!!! Please email me if you would like to place an order. But I'm going to! I've been CLEANING! - So sorry to have sworn, please forgive me!!! I've nothing to show you today, here on my blog, but you should come over and see how clean Kim's bedroom is and how clean all my outside white plastic window frames, windows and facias are! They are amazingly clean and sparkling! I'm sooooooo pleased with myself! I've also had a friend over who helped me clear out some old card/project samples, well it took us ages deciding what to do with them? Do we revamp? Do we just chuck? or Can any of it go to charity? Well we sorted it all appropiately and I'm really pleased that I now have room for some more new samples, so I had better get making!!! Well, when I've done my paperwork!!!! Thats next - funny how its always next!! I'm out doing my other new hobby tomorrow and perhaps I will do some paperwork on Sunday and Monday, as I'm now hoping to go away on Tuesday - Wed/Thurs next week. Some of our friends moved to Dorset at Christmas and I'm dying to have a "nose" at their new home (I feel it necessary to picture my friend in her home surroundings when I call her), so I phoned and have arranged a visit! Lets call it a mini holiday, I'm sure I need one of those! And she lives close to Martin Clunes, so that makes my visit even more necessary, he hasn't met me yet! So while I'm cleaning, tidying, clearing out and getting on top of my post, filing and books, I hope you can be having a great time out in the sunshine or crafting. I will be back as soon as I'm up-to-date, but in the mean time, if you need anything from Stampin' Up or want to come over let me know! Well DH is hoping that I spend much more time on my other new hobby, but his eyes did light up when he smelt what was cooking this afternoon. C U P C A K E S ! ! ! Wow these are special, I only made 6 (first trial) and the first one decorated had to go to my lovely neighbour Jimmy Rowe, who happily lent me his nozzle (piping of course!) so that I could have a little go at fancy icing. So as David is on a diet and losing lots of weight and I'm gaining what he loses :(, why did I think to come up with Cupcakes now? Don't ask, OK I'll share.... I went to a fund raising event for our local hospice, Sobell House, at the weekend and I ate the most delicous cupcake (for charity, I had to, honestly the money was going to charity and it wouldn't have looked good if I had said I was on a diet!). Enjoying that cake made me think that I could also make cupcakes and have spent the past couple of days researching the subject and this is my first attempt. Malteser cupcakes, oh I wish they weren't so flippin' good! I can't imagine trying any other recipe now! So if you fancy trying my special cupcakes you will have to start attending some of my workshops/crops, where I hope to be making cupcakes for charity. I want to raise money for the Marfan Association, which is the association that supports families affected with this light limiting Syndrome. If you would like me to make you some, let me know and I'll see if I have any time. I made these cards some time ago and whilst shifting through lots of projects looking for something else, I found these today and remembered that my lovely customer Fiona wanted to see these samples - so thought I'd blog them for her to see. I have been working again........its non stop around here! Hope you like this card, I've used my Fiskars Paper Cutter, with the scoring blade in and have embossed the edges of the image mat. Have a great day of crafting. I've put together a little mini album to show off one of my new favourite colour combinations; Old Olive, Rich Razzleberry and Whisper White. I can't beleive its taken me three days to design and make it, but I am pleased with all of the new techniques I've used and the finished result. Please leave me a comment and let me know what you think. If you fancy making one at an all day workshop, let me know and it can be arranged. 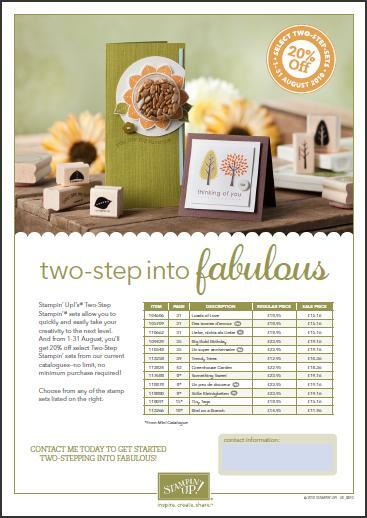 All products used are by Stampin' Up apart from the binding. Card stock is Old Olive, Rich Razzleberry, Whisper White, Designer Paper is: Cottage Wall, Stamp sets used were: Vintage Vogue, Live Your Dream, Close as a Memory, Baroque Motifs, Framed with Love, Tiny Tags and Polka Dot! I also used Whisper White Satin Ribbon, Rich Razzleberry Grosgrain Ribbon and Old Olive Grosgrain Ribbon and punches: Large Heart, Boho Blossoms and Medium Jewelry Tag. Have a great day and happy crafting. I'm back, two posts in one day, no wonder my house is a mess! I wasn't really too sure about the car spinning, I really wanted it to be driving by nicely! On this card I used 4, 1 euro cent coins, making two slider mechanisums so the car couldn't spin! It does though, slide as planned, quite nicely in fact. If you would like to make one with me, check out when my next class is! Stampin' Up products used: Loads of Love, Neighborhood (Neighbourhood) wheel, Brayer, Stampin' Up ink and markers, Naturals Ivory & Going Grey Card Stock and one of my new favourite products Platinum Shimmer Paint for the chrome! I have been asked recently about Penny Spinner and Slider cards. Here is a penny spinner card I've just designed using the "Loads of Love" stamp set and the "Neighborhood" wheel, both from Stampin' Up. I masked off the houses with a fab product I've just learned about - Frisket Film. Email me if you would like info about Frisket Film. the car actually spins really well - looks like a horrible accident, I'm pleased to say that nobody gets hurt in my art work - the car is empty and nobody is walking along the side of the road! I am just lovin' my sponged backgrounds. They do take a little practice, but so long as you go very gently onto the ink and then very gently onto your cardstock, you can create a background that doesn't show spots - you know - the ones that show with the first "hit" of the sponge! I also work on a craft sheet, I start off my cardstock first, placing my sponge lightly onto the craft sheet and in a circular motion gently travel the sponge towards the card. If you don't have a craft sheet, then I understand you can use a peice of waxed paper. Its handy to have a damp peice of kitchen towel to clean your mat each time you change colour. Here a couple of cards, the one on the right is using only stamps from the set "Touch of Nature" and a little shrink plastic! The stems on the card on the left is from Autumn Days, with the flowers made from the Boho Blossom punch. My lovely friend Joyce is 60 today, I'm sure she won't mind me telling everyone! I've used some papers from my stash along with the Vintage Vogue stamp set and flower from the Pretties Kit by Stampin' Up. I'm off to Newbury for the Artstamps show today. Its all work again around here, what a job - but someone has to do it! Have a happy day everyone. Welcome to my blog, thank you for popping by. I have two grown up girls, who have left the nest and a husband who is happy that I'm happy crafting ;)! I have been a crafting teacher for about 17 years. I have been teaching the Silhouette software (Silhouette Cameo/Silhouette Portrait) for the last 5 years, on a one-to-one basis and also teach/run workshops on Parchment craft, using the Clarity Groovi system and general card making classes. If you are interested in being looked after for the day while you learn how to make your crafting projects look great, then email me. I'm looking forward to sharing my knowledge with you soon.